Heat oven to 350°F. Spray bottom only of 13x9-inch pan with nonstick cooking spray. Line bottom with waxed paper; spray and lightly flour paper. Generously spray and flour 10-oz. custard cup. In large bowl, combine cake mix, water, oil and egg whites; beat at low speed until moistened. Beat 2 minutes at medium speed. Pour 1/2 cup batter into sprayed and floured custard cup. Pour remaining batter evenly into sprayed and floured paper-lined pan. Bake at 350°F. until cake springs back when touched lightly in center. Bake custard cup for 20 to 30 minutes; bake 13x9-inch pan for 28 to 33 minutes. Cool cakes in pan and cup for 15 minutes. Invert cakes onto wire rack; remove pan, cup and paper. Cool 30 minutes or until completely cooled. For angel's halo and head, flatten foil baking cup; place at point of center triangle between wings. Invert small round cake onto halo. In medium bowl, combine frosting and whipped topping; blend well. Reserve 1/4 cup frosting mixture for hair. Frost sides and tops of cake pieces. Sprinkle coconut over wings. Sprinkle wings with edible glitter. Place candies on cake for eyes, mouth and buttons. Add yellow food color to reserved frosting; blend well. Spread or pipe frosting on head for hair. Cut wafer cookie and add to cake for songbook. 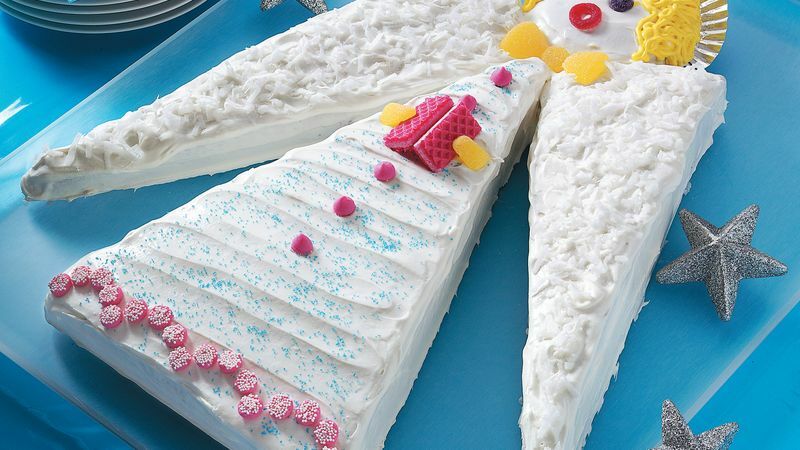 Attach small candies with frosting for hands. Store in refrigerator.